We left Castine on August 25th pulling into Charleston on November 3rd, putting about 1,500 nautical miles (1650 statute miles) in 71 days under our boat's keel. Last Monday we picked up a rental car for our Thanksgiving week back on land. A whirlwind week that included Thanksgiving with my folks and our nephew's wedding in Chicago, covering over 2,000 statute miles in 7 days. I think this speaks not only to the modes of transportation but also to the land vs water lifestyles. A week of land-based hustle and bustle makes us appreciate our time onboard. On the boat our schedules are loose at best, impacted more by the weather than anything else. Dressing up means putting on a clean shirt and shoes. There are no time schedules and the only firm appointments are breakfast and dinner time for the canine crew - 7:30 am and 4:30 pm, in case you wondered. 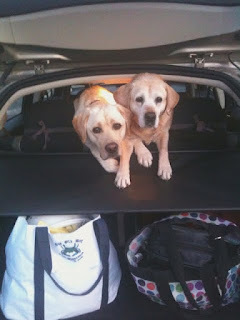 We loaded the car with Jeff's single suit and my one dressy outfit along with food, treats, toys, and the kids' other necessities -- and left Charleston. Dyna and Dylan put four more states under their belts: Tennessee, Kentucky, Indiana, and Illinois. 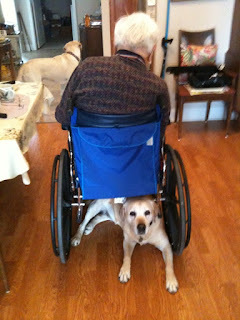 Dyna kept her Grandpa company while Dylan kept his eye on the kitchen hoping to woo his Grandma into some special treats. She always was a softy. 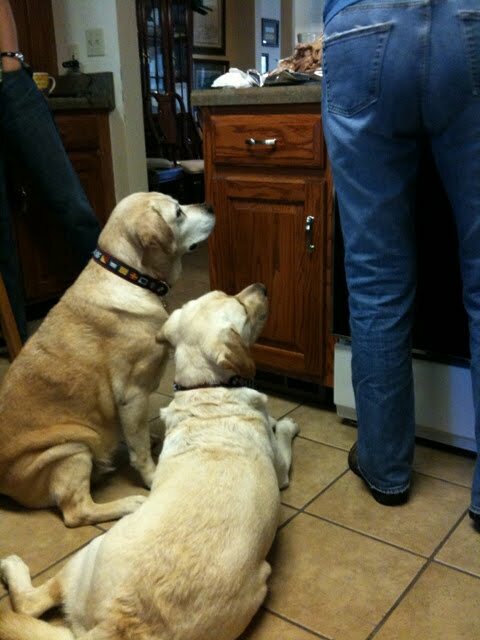 Their Aunt Jane thought they were indispensible when it came time to carve the turkey. They were pleased to help clean the floor when pieces of turkey somehow landed there. 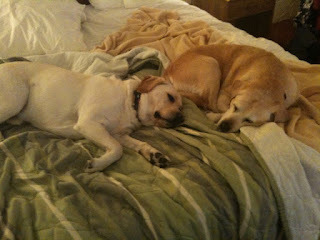 Nice big hotel beds were appreciated after months of sharing the master stateroom bed on aCappella. The wedding was lovely even though Dyna and Dylan's offer of flower girl and ring bearer was politely refused. Frankly, we think maybe the bride and groom were concerned of being upstaged. The kids are awfully cute, after all. It seems like such a simple thing - replacing our old inverter with a new one. I hated the old Xantrex/Heart 2500. It's modified sine wave output destroyed a sewing machine and a variety of electronic equipment over the years. It stopped working in 2007 in Vero Beach when I wasn't able to do much more than just replace it with a duplicate. I had been waiting for the new one to give me trouble so I could yank it out. That day finally arrived. An inverter is the device that gives us normal AC/120 volt power from our batteries. Many also include a large battery charger used to re-charge the batteries when connected to shore power or a generator. It's an important component providing power and balancing the battery charge with efficiency. It's a pretty complex piece of gear with a lot of wiring. The old Xantrex remote stopped working during this cruise. This meant that every time we wanted to use it, we had to crawl through the lazarette to turn it on. That got pretty old and we just left it on all the time - not great for efficiency but better on the knees. 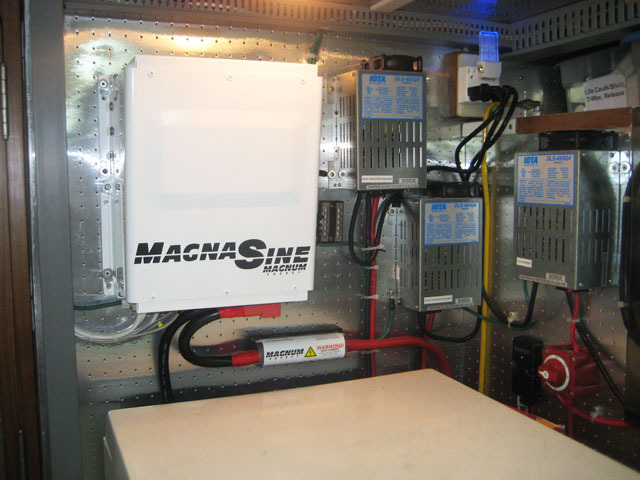 With time and access here in Charleston, I ordered a new Magnum MS2812 true sine wave inverter. It's rated a little larger than the Xantrex but is supposed to be a lot more reliable. It puts out a real sine wave AC that all electronics will love. The new remote and battery monitor provides a lot more information to help us monitor and control our power usage. There's a temperature sensor on the batteries to provide efficient charging and there's even an option to automatically start our generator when the batteries get low (we're not installing that yet). It should have just been some wire disconnects, a swap of the 60 lb boxes, and some wire attaching. But I decided that I'd rather re-route the wiring properly and keep everything neat and clean. The old Xantrex, to my horror, had no fuse - a possibly dangerous situation if the unit ever had a major failure. I corrected that and installed a large 400 amp fuse to protect the large cables coming off the battery. The battery monitor required a negative bus shunt and it seemed like the right time to clean up the ground wires for that end of the engine room. It took a whopping 30 hours to install and clean everything up. It really looks so simple but there's a lot going on behind the scenes. I'm extremely pleased with the results - it's clean, efficient, and well-installed. It's now keeping the batteries at full charge and giving us all kinds of data on the remote to let us know what's happening. And next time we need a stern anchor to stop the boat from swinging, I'm attaching a line to the old Xantrex and throwing it off the back of the boat. We love meeting people who are out here cruising or are interested in cruising. Having the ActiveCaptain logos on the sides of the boat has brought people from far and wide to our boat. We've seen other boats circle us at anchor (waving their ActiveCaptain hat); people have come up in their dinghy (offering cars, assistance, anything we need); and we've been hailed on the VHF radio on the ICW (are you the people who run ActiveCaptain?). But Friday was more fun. Don and Cindy drove to Charleston to meet and talk with us. And they brought pound cake. 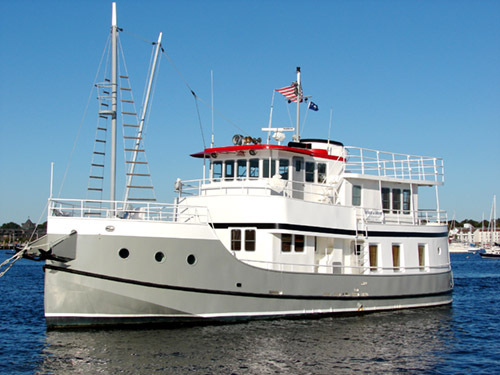 Don and Cindy are in North Carolina and have been looking for a boat to do some extended cruising. They had a variety of questions and wanted to just talk some things through about their needs and desires. And they brought pound cake. We had a great time with them. They are cruisers in every sense of the word. They'll fit very well into the lifestyle and will make the community better for everyone. I'm really looking forward to watching their progress and helping where possible. Did I mention that they brought pound cake? 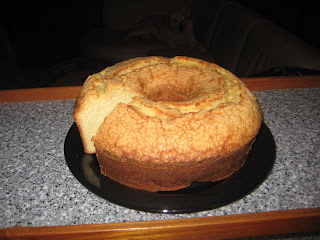 OK, a word about this pound cake. It quite honestly might be the best thing I've ever eaten ever. Cindy gave us all types of instructions about freezing it so it would last. Trust me Cindy. Your car wasn't out of the Charleston City Marina when we'd already broken into the cake. There is no chance that this thing is going to spoil - what little is left of it! Thanks for coming - it was fun meeting you. My husband is what polite company would call meticulous. I sometimes have another word for it. Something he has always insisted on is an hourly engine room check when we are underway. 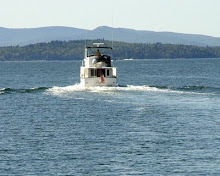 We do this whether we're out for a day cruise on the Penobscot Bay or heading offshore overnight. In the beginning I thought he was just "being Jeff" but after discovering some potentially serious issues before they became big problems I realized how important this routine is to our safety. A week or so ago Jeff did a video about the broken hose clamps he found during our overnight trip to Charleston. Losing a hose to a water intake could sink the boat. The engine room checks discovered it when it was just a drip and not a gusher. He thought the video was a good illustration of the importance of simple safety precautions such as engine room checks. Apparently others agreed. OceanLines, the online passagemaking magazine, ran his video this week to emphasize this point. 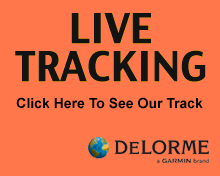 See what they said at The Underway Engine Room Check: Why You Need It. On Saturday afternoon Linda called with an invitation from Carly and Andy for Dyna and Dylan - swimming at the dog beach Sunday morning. Carly (Carly Simon) and Andy (Andrew Jackson) are a female Golden and a male Labradoodle who have adopted Jeb and Linda here in Charleston. They said that Jeff and I could come along. The kids gladly accepted the invite. We were picked up at 9AM at the entrance to the City Marina and off we went to Sullivans Island. We parked on a little side street and walked down the boardwalk to a beautiful beach, miles long, full of dogs. As the video shows, a good time was had. Dyna and Dylan experienced their first real ocean waves. Dyna quickly learned to ride them while Dylan was frightened by a dead horseshoe crab. An hour or so later, we led four wet and exhausted dogs back to the cars and headed to Jeb and Linda's for dog baths and an air-dry in the back yard. The kids got baked sweet potatoes and we got great BLT's. 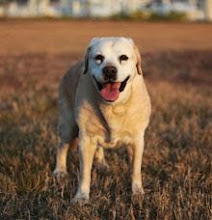 By the time Dyna and Dylan were dropped back off at the marina, the 1/4 mile walk to the boat was looking awfully long. Needless to say the rest of the afternoon and evening have been quiet and Jeff and I look forward to being able to sleep-in in the morning. Charleston is one of our favorite stops. I don't think we've ever missed pulling in. The restaurants are amazing, the city streets are beautiful, there are great grocery stores for provisioning, and the 5 star Charleston City Marina is a wonderful facility with a van to take you wherever you want to go. Typically we stay 2-3 days and move on looking forward to coming again on our next pass. On our way in on Tuesday afternoon we called our good friends Jeb and Linda and were lucky to have dinner with them before they flew out to Dartmouth on Wednesday morning. They took us to an excellent tapas restaurant where we had the best sliders (small burgers) I have ever had in my life - honest. We hugged them goodbye and promised to stop back on our way north next Spring. Wednesday morning was glorious, bright sunshine, mild temperatures, and dry air. We discussed over breakfast what to do on our one day in Charleston. First was to get the crew off for a long walk. We decided to take them separately and each headed off in different directions. Jeff has been working with our stubborn Dyna-girl who feels that a creature of her stature should never have to walk on a leash. By the time we had returned to the boat we were wondering why we should be in such a hurry to leave. A check with the harbormaster presented us with two options for monthly slips. We signed up for the one with the water view for the month of November. So for now, Charleston is home. The kids will have daily walks and Dylan can pursue an advanced degree in Charleston blackbirds. Blame it on the good weather, blame it on good friends, or blame it on the sliders, we are looking forward to becoming more familiar with this lovely place. I like overnight passages. You get to put a lot of miles under the keel in one shot and it really tests your nautical skills. There is little room for making mistakes in the middle of the night and the boat has to be in good shape. There's an element of trust between man and machine in the process that I find interesting. I completely understand that they can be scary too. Once out, it's hard to pull in somewhere if the weather gets too rough. And being offshore can put you so far offshore that just getting back could take many hours. 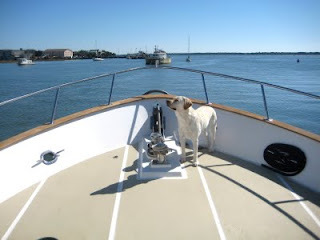 The trip from our anchorage on the South River outside of Beaufort, NC to Charleston, SC is 240 nautical miles. That's the equivalent of three very long 80 mile days. The weather predictions looked pretty good when we left and moving out the inlet into the ocean seemed within our level of tolerance. In the end, it wasn't our worst overnight, but it was far from our nicest one too. All in all, the videos tell the whole story.